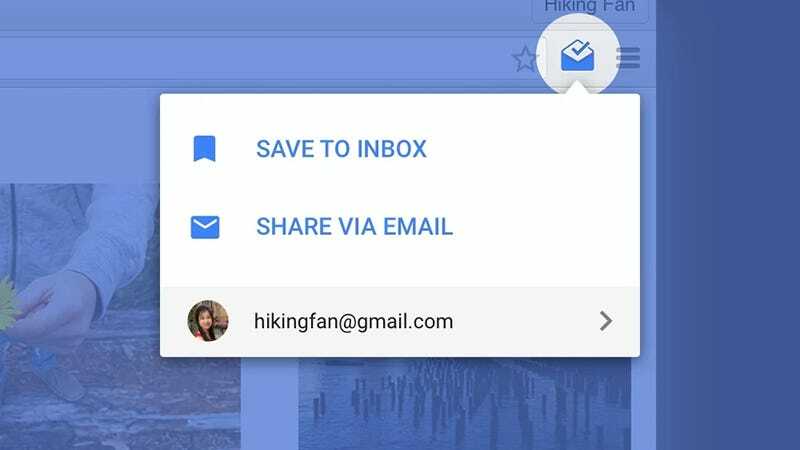 If you’re looking to ditch your favorite read-it-later service, all you need is the Google Inbox app, Google’s newest email client. Here’s exactly how to save pages from the web to Inbox so you can catch up on reading later. Articles you want to read later can be added from Android or iOS provided you have the Inbox app installed. Articles from the web can be saved through the Inbox Chrome extension. It’s not a hugely sophisticated system right now, but Google obviously has its sights set on the likes of Pocket and Instapaper. On a phone, use the Share option in Android or iOS with a website or video open in any app, then choose Inbox from the list of options that appear. With the Chrome extension, just click once on the icon then pick Save to Inbox. All your saved articles appear in one of Inbox’s famous “bundles” for you to swipe through at your leisure. The app doesn’t do anything special with the links—they’re just a list of URLs saved to your inbox—but if you spend a lot of time in Google’s Inbox app, it could actually be a lot of help. The Saved label and bundle can be configured like any of the others through the settings pane. The new Inbox feature isn’t the only read-it-later tool Google has quietly launched. The company has also rolled out its own Chrome extension that makes it easier to keep track of links we want to save. Save to Google is another newly launched official Chrome extension from Google that does exactly what it says it will. It’s little more than a rebranded bookmarking service: you click the extension button to instantly save a link, and there’s the option to add a tag or two if you need some way of organizing your reading list. Again, there’s no smart Instapaper-style reformatting of the articles, it’s just a bunch of links kept in one easily manageable place. In fact, you can just as easily use Chrome’s bookmarks, but if you want a quick and easy way of getting all your links in one place then it’s another option to consider. Visit google.com/save to see what you’ve already saved.